To stay healthy always and to have bonding session with my Little Angels, Mommy Jane and Little Angels will go for a fun run occasionally. 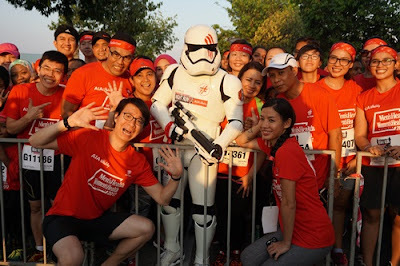 When Mommy Jane came across Men's Health Women's Health Night Run ("MHWH Night Run"), I had registered for the 5km fun run while Little Angels had registered for 700m kids run which was held at MAEPS Serdang last Saturday evening. 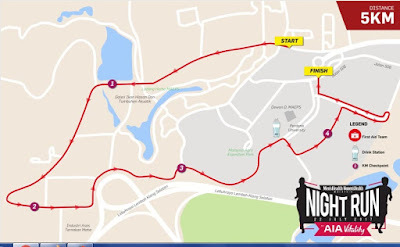 The night run invites families to spend to spend times together with their pint-sized runners on an action-packed and fun-filled Saturday evening. 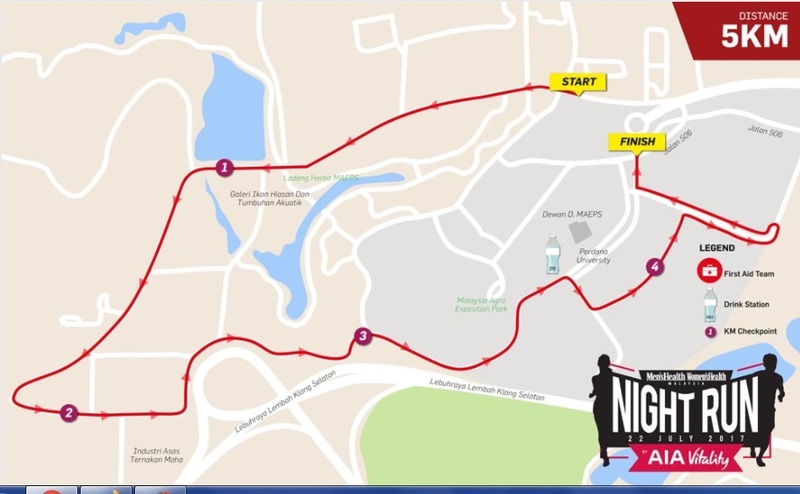 MHWH Night run is Malaysia's largest night run series which had attracted more than 20,000 runners. Adults and Children had joined the run together. 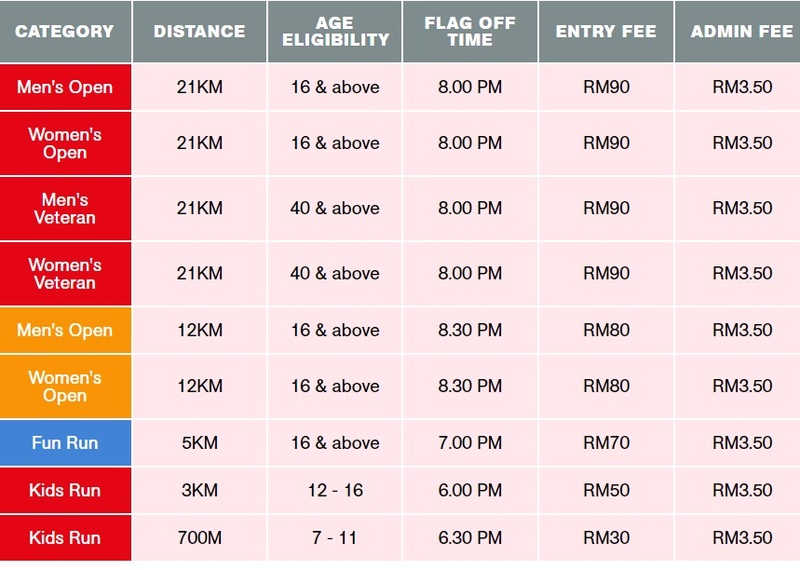 There are few categories for Men's Open, Women's Open, Men's Veteran, Women's Veteran who run for a distance of 21km. Another category for Men's Open and Women's Open who run for a distance of 12km, Fun Run at 5km, Kids (12-16 years old) Run at 3km and another Kids (7-11 years old) Run at only 700m. All the categories had different flag off time and different route to explore. My Little Angels and I had explored 700m and 5km fun run together. For the 5km fun run, Mommy Jane and Little Angels running together while enjoying the beauty of the nature with fresh air. While running, we chat and update each other progress. We encourage each other to run till the finishing line. It was indeed tiring running for both sessions but it was fun. Some parents brought their pram with their baby inside, some children riding bicycles, some run with roller shoes and skate board. Everyone was there just to join the fun of running. Do watch the video below for the starting of the 5km fun run. All participants received the medal and certificate upon completion. For 12km and 21km, there are prizes for 1st, 2nd and 3rd. All participants were entitle for a goodie bag. Aside from the main event, there were lots of activities with prizes to be won. Samples of energetic drinks, Lucozade Sports were provided to keep us hydrated. For dinner, there are over 20 food trucks offering different specialty at affordable prices. Kak Hanny, kena exercise lebih sikit. Harap kaki Kak cepat sembuh. wah...bagusnya jane...saya tak larat la jane nak lari2 sekarang ni...haha dah tua dah saya nii..
Lina, u mana tua. Masih muda lagi. Banyakkan exercise, pasti berjaya. healthy lifestyle is good for us.. keep healthy mommy jane! Mrs Puex, thanks for your support. Anis, do spend some times on healthy living. The running community is a very social group even though running is an individual sport, right? congrats Jane!! Wahhh... Full activity on weekend. Finally, we always busy on weekend. That is the time that we can learn and explore together. Bro, l understand. Hope you will able to get some helps soon. Kelly, it is indeed fun. You should start your run too. Congrats on completing the run. What a fund run this was for the entire family! Emily, tq. It is indeed fun. The family that runs together stays healthy together too! Good job there Jane! Burhan, thanks for your support. James, thanks for the infor.